With Valentine’s Day quickly approaching, why not try your hand at making something yummy for your sweetie? The fact that these are pretty and elegant is just icing…. 1.Line a tray or baking sheet with waxed paper; set aside. Wash strawberries and pat until completely dry. 2. In a microwave-safe bowl, melt vanilla chips and 1-1/2 teaspoons shortening at 70% power; stir until smooth. 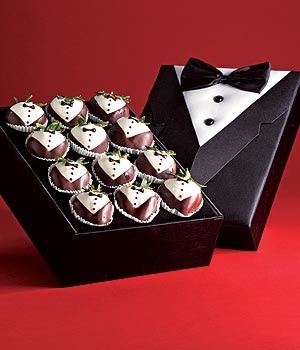 Dip each strawberry until two-thirds is coated, forming the tuxedo shirt, allowing excess to drip off. Place on prepared tray; chill for 30 minutes or until set. 3. Melt chocolate chips and remaining shortening. 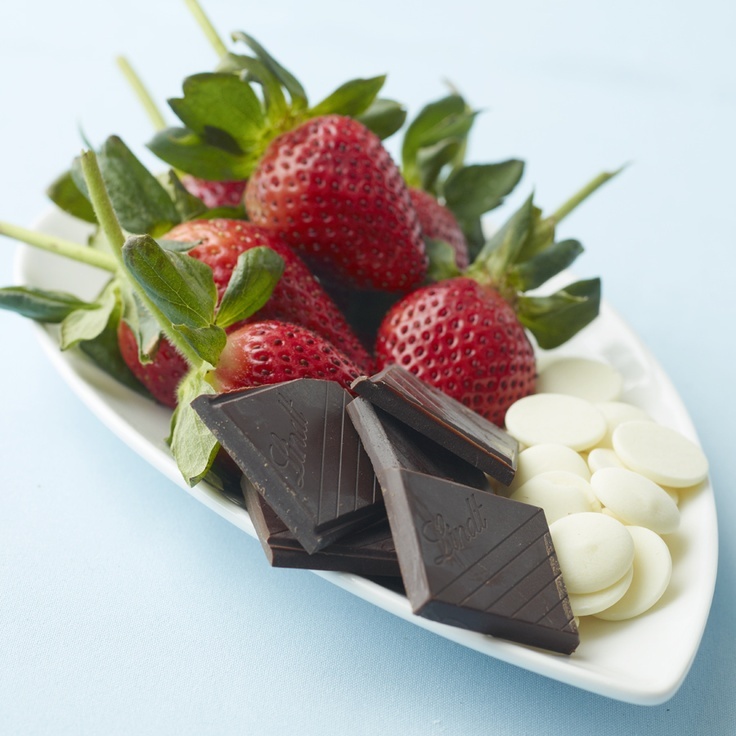 To form the tuxedo jacket, dip each side of berry into chocolate from the tip of the strawberry to the top of vanilla coating. Repeat on the other side, leaving a white V-shape in the center. Set remaining chocolate aside. Chill berries for 30 minutes or until set. 4. Re-melt reserved chocolate if necessary. Using melted chocolate and a round pastry tip #2, pipe a bow tie at the top of the white V and three buttons down front of shirt. Chill for 30 minutes or until set. Store in the refrigerator in a covered plastic container for up to 1 day. 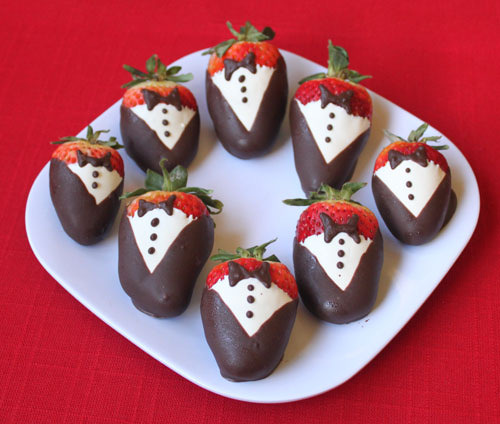 This entry was posted in Foodie Friday, Holidays, Just Because, Recipes and tagged Strawberries, The way to a man's heart, Tuxedo. Bookmark the permalink.